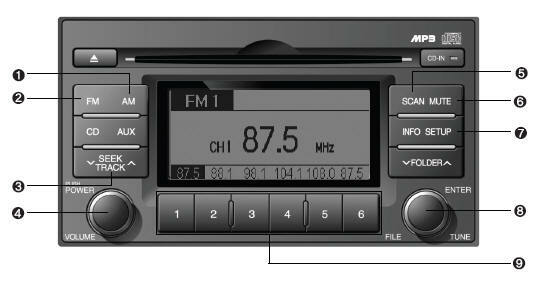 Turns to FM mode and toggles FM1 and FM2 when the button is pressed each time. it reduces the band frequency by 200khz to automatically select channel. Stops at the previous frequency if no channel is found. it increases the band frequency by 50khz to automatically select channel. Stops at the previous frequency if no channel is found. Turns on/off the set when the IGNITION SWITCH is on ACC or ON. If the button is turned to the right, it increases the volume and left, decreases the volume. If this button is pressed, the frequencies will become increased and receive the corresponding broadcasts. This function will play the frequencies for 10 seconds each and find other broadcasts as the frequency increases. Press the button again when desiring to continue listening to the currently playing broadcast. Press this button to turn to the SCROLL and P.BASS adjustment mode. If no action is taken for 5 seconds after pressing the button, it will return to the play mode. (After entering SETUP mode, move between items using the left, right and PUSH functions of the TUNE button.) The setup Items changes from SCROLL <->P.BASS. Turn this button clockwise one notch to increase frequency from current frequency. Turn this button counterclockwise by one notch to decrease frequency from current frequency. The frequency cahnges by 0.2Mhz in FM MODE and 9Khz in AM MODE. Press this button while holding SETUP button to activate / inactivate the item to. Select SETUP item using left and right function of the Tune button. Push ~ buttons less than 0.8 second to play the channel saved in each button. Push PRESET button for 0.8 second or longer to save current channel to the respective button with a beep. o Do not place beverages close to the audio system. The audio system mechanism may be damaged if you spill them.